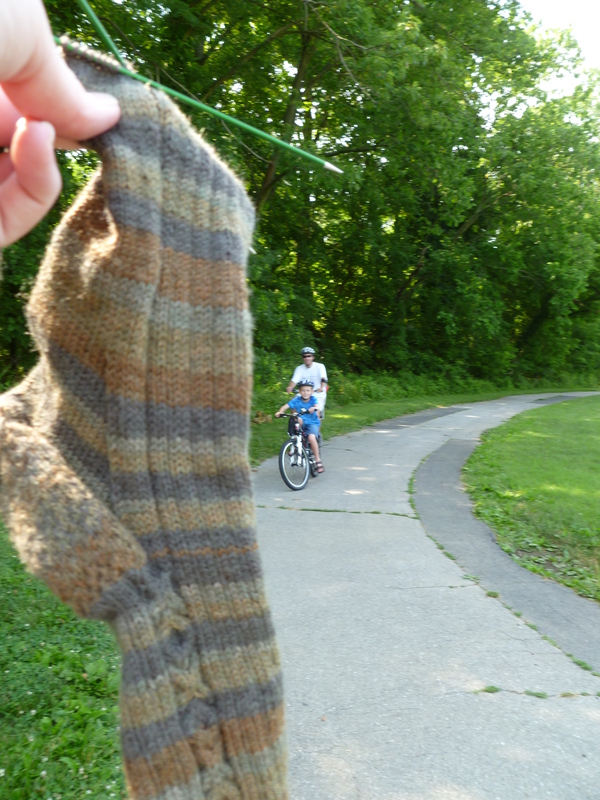 On Sunday, the sock went on a bike ride. Hubby and I took the kids up to Baltimore for Tour Dem Parks, Hon! We rode 14 miles, and I didn’t die. (Still a little surprised on that count!) The kids didn’t complain. (Bonus!) It poured rain for ten minutes at the very end (so we all felt much cooler! ), and then the sun came out, so the sock went with us to the after-party, where I almost finished it. Of course, I’ve been about five rows and kitchener from the end of this sock for the past three days, so once again… progress is slow with this puppy! Are you ready for WWKIP Day? Where will you be KIP this weekend?